Essential 6 for Cats is a revolutionary skin and coat care for all types and conditions of cats. It promotes excellent skin and coat health while controlling body odor and reducing dermal irritation. The spot-on solution repairs damaged skin condition and improve dull skin. This dermatological solution reduces seasonal hair loss, improves coat sheen, deodorizes body smell and prevents skin conditions due to bacteria, yeast and fungi. It maintains overall skin and coat health of felines. Essential 6 is applied directly onto the skin. The various ingredients work together to keep skin healthy. On application, the solution bio-diffuses through the skin and then it is stored in the sebaceous glands. It is progressively released from the sebaceous glands. It is then distributed along the body and absorbed into the skin. This balances trans-epidermal water loss to optimize skin hydration and maintain the cutaneous ecosystem balance. The spot-on reduces odor and leaves your cat naturally fresh smelling. Remove the pipette from the pack and break open the seal. Part fur to spot a visible skin between the shoulder blades. Place the pipette on this spot and empty the entire content on the spot. Leave on the area to diffuse naturally. For long-haired cats, gently brush out the application site 24 hours after the application to remove any residue remaining on the hair. Begin initial treatment with the application of 1 pipette once weekly for 8 weeks. 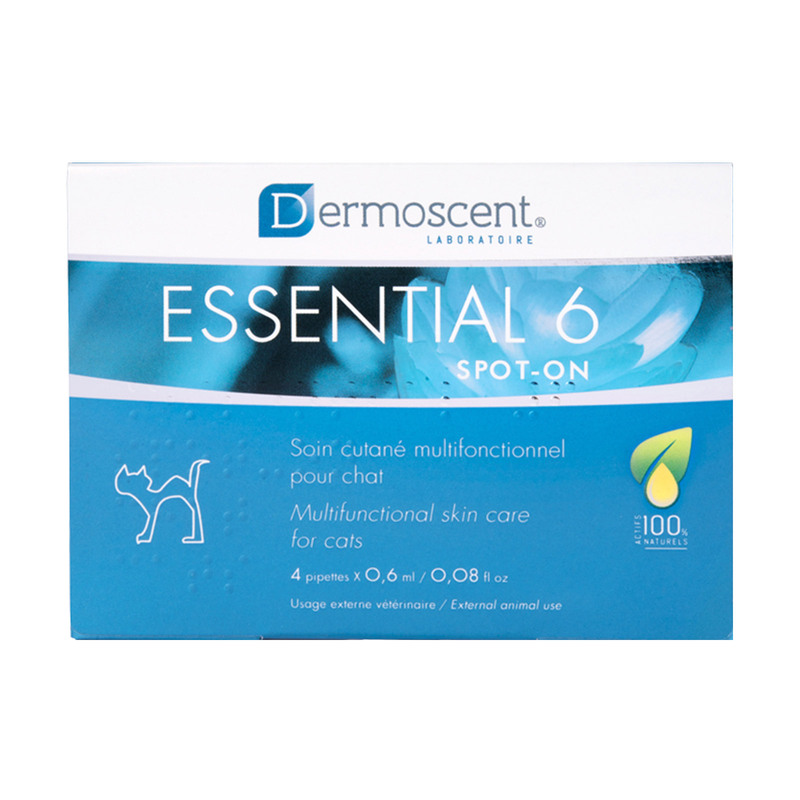 ‘Essential 6 for Cats’ is a top-rated skin care product recommended by veterinarians. It shows significant improvement in coat and skin condition in just 4 weeks of use. The topical solution promotes healthy skin and coat condition while controlling odor and reducing dermal irritation. It fights against bacteria, yeast, fungi and external parasites. The spot-on provides a lasting deodorizing effect while improving dermal hydration. Essential 6 for Cats is formulated with 100% natural plant based ingredients. Essential 6 spot-on should not be used 2 days before or after bathing. Essential 6 spot-on has not been tested in kittens under 3 months old. It is safe and well tolerated by cats. This product does really well to promote skin and coat health in my kitty. Great product!